They do not have a Le Pain Quotidien in San Diego, but they do have a few restaurants up north, like in Newport Beach and Los Angeles. 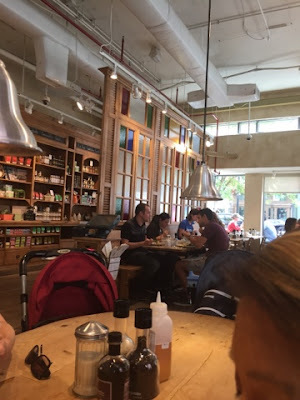 I actually have not heard of it until it was mentioned by my sis, L, while we were deciding where to go for Sunday brunch during my mini East Coast trip. 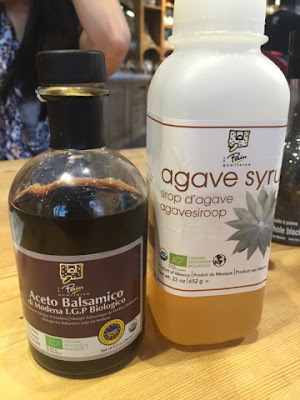 L's hubby, MK, says that it can be a bit overpriced for some of the items, but I think it may be costly because they use organic ingredients, which I would gladly pay for any day! This restaurant was so cute. It has so many windows. I love the natural light. When you walk in through the front doors, it has a selection of food gifts to purchase, including some that were on our big, communal table. There is a bakery/cafe counter for those wanting a quick, organic pastry and espresso or drip coffee. 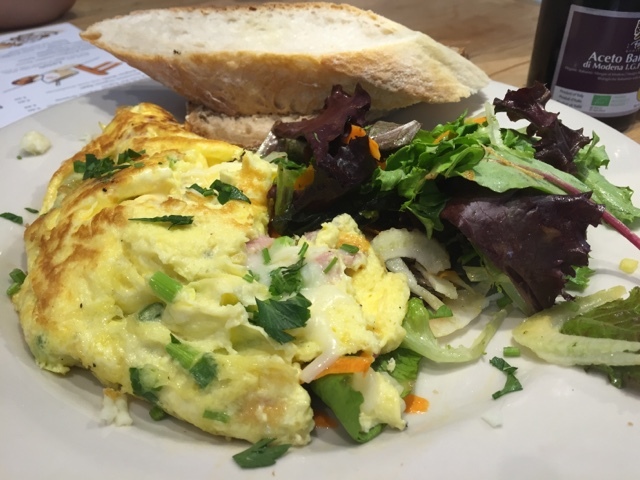 All organic omelettes are served with their signature organic bread and a side salad. 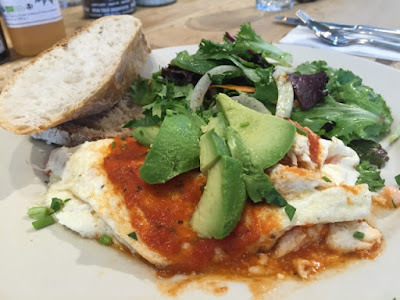 My older sister, S, ordered the Avocado and Tomato Omelette ($11.30). She ordered it with egg whites instead for an additional $1.25. The avocado slices were nice and fresh looking. 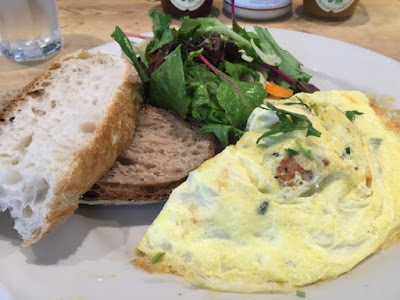 L and MK both ordered the Paris Ham and Gruyere Omelette ($12.45). 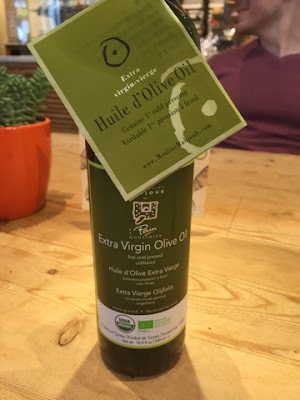 I did not have a taste of theirs, but they said that they order this all the time since they have Le Pains in Philadelphia. I ordered the Chicken Chorizo and Cheddar Omelette ($13.20). It came out really pretty. 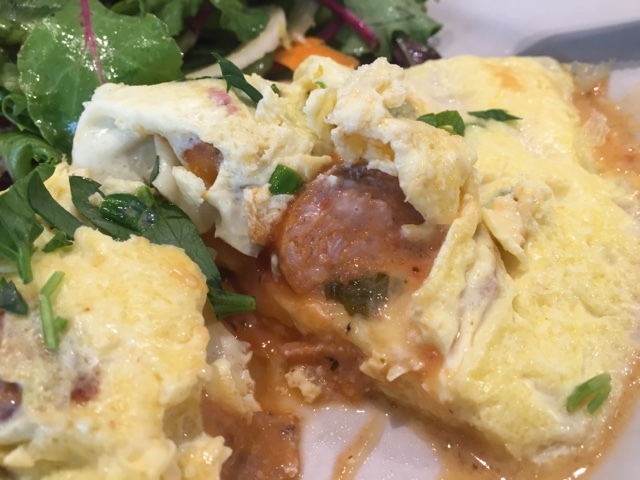 I pictured bits of ground chicken cooked down with spices, but it turned out to be a "sliced sausage" omelette. Regardless, the chorizo itself, still was really good. I found my omelette to be a little watery? I was trying to figure out where it was coming from, but then I remembered that they said there was a little salsa in there. The side salad was refreshing and light, but the taste of the raw fennel overpowered everything. I shoved the fennel slices off to the side after a few bites of tolerating the flavor. Our server brought us a wide selection of their organic jams and spreads to try with our bread. 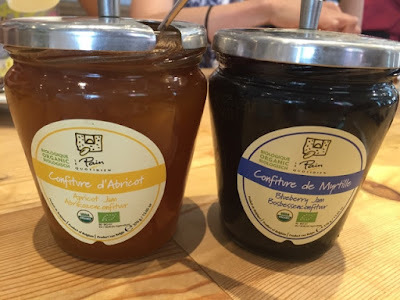 Shown above is the Apricot Jam ($7.25) and the Blueberry Jam ($7.25). 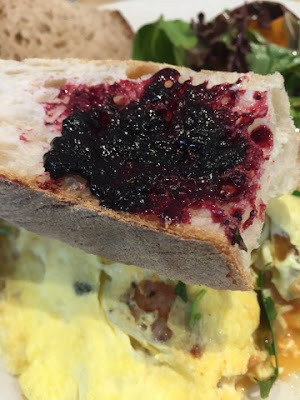 Goodness, the blueberry jam was so delicious -- tart, sweet, and perfect with the bread. I loved it so much that I bought a jar to take home with me. Here is a shot of the blueberry jam goodness on my bread. 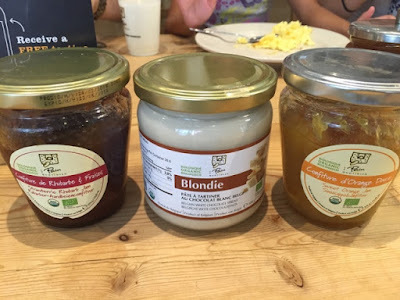 He also brought us Rhubarb Jam ($7.25) - no thanks, Blondie white chocolate spread ($11.25) and an Orange Jam ($7.25). 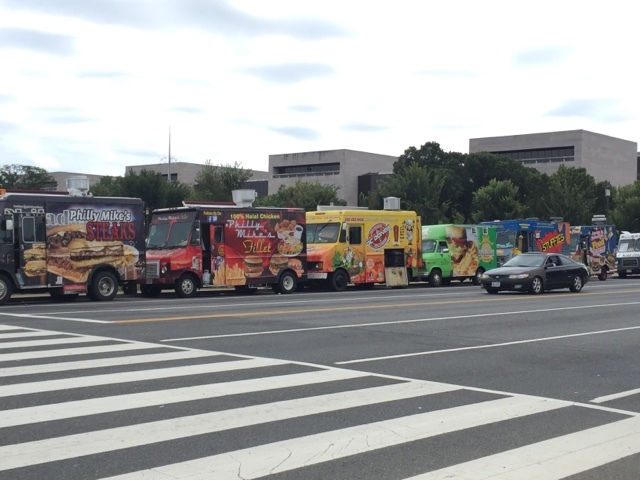 I only tried the Blondie and it was super, duper sweet, but really, really good. On our way out, I felt like I *had* to get a pastry from the bakery counter. 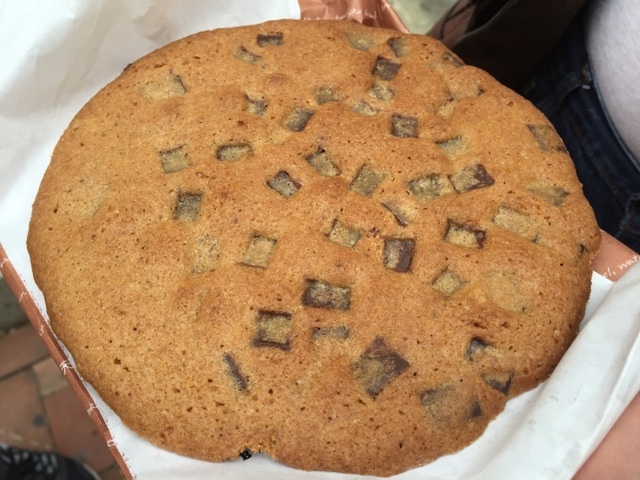 L and I decided to split the biggest chocolate chip cookie ever ($3.25). 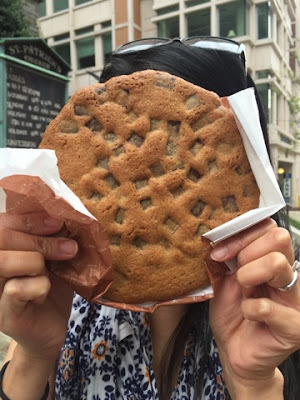 It was as big as her face. It was crispy on the outside and chewy in the inside. It was a nice end to the breakfast/brunch we had. We walked towards the National Mall afterwards, and saw that they had so many food trucks and little vendors selling stuff. Aww, man. We were too full to try out some of the local trucks. Oh, well. Maybe next time! 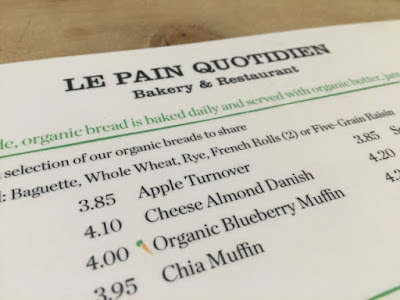 We still had a great time at Le Pain Quotidien. The Holiday Feasts serve between four- eight people and features a complete dinner with all of the trimmings and, of course, a Marie Callender’s signature Pumpkin or Apple Pie. 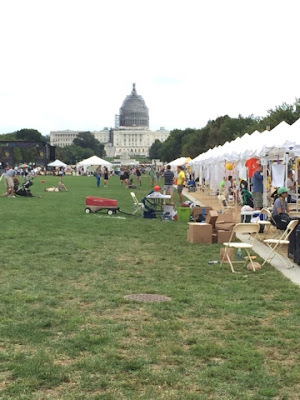 All Feasts are conveniently packed and ready to go. All you need to do is heat, serve and enjoy – it’s that easy! Turkey Breast Feast ($99.99) – An oven roasted turkey breast with all the feast trimmings, serves four- six. Ham Feast ($109.99) – A bone-in spiral cut quarter ham and chipotle-pineapple glaze topping with feast trimmings, serves four- six. 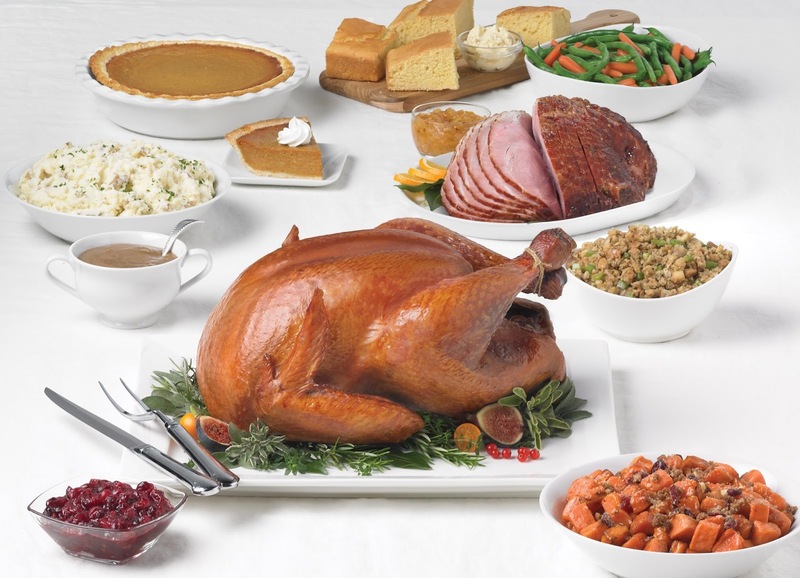 Ultimate Whole Turkey Feast ($119.99) – A whole roasted turkey with all the feast trimmings, serves six-eight. Ham and Turkey Combo Feast ($139.99) – A roasted turkey breast and Marie Callender’s bone-in, spiral cut quarter ham with chipotle-pineapple glaze topping and all the feast trimmings, serves six-eight. Ultimate Ham & Turkey Feast ($149.99) – A whole roasted turkey and Marie Callender’s bone-in, spiral cut quarter ham with chipotle-pineapple glaze topping and all the feast trimmings, serves six-eight. Happy eating and season's greetings! * Image provided by Marie Callender's. M, my hubby, quit sugar recently and he had such a sweet tooth. He says he got it from when I was pregnant because I craved sweets all the time. Okay, hubby, sure. *smirk* I have made this banana bread before but it includes sugar and vanilla extract. I decided to omit both ingredients and add an additional ripe banana to compensate. I was curious to see how it would turn out. This recipe is a little variation of this banana bread recipe I found on Simply Recipes. My usual 'with sugar' recipe includes 1/2 cup of brown sugar, as opposed to 1 cup of granulated white sugar. 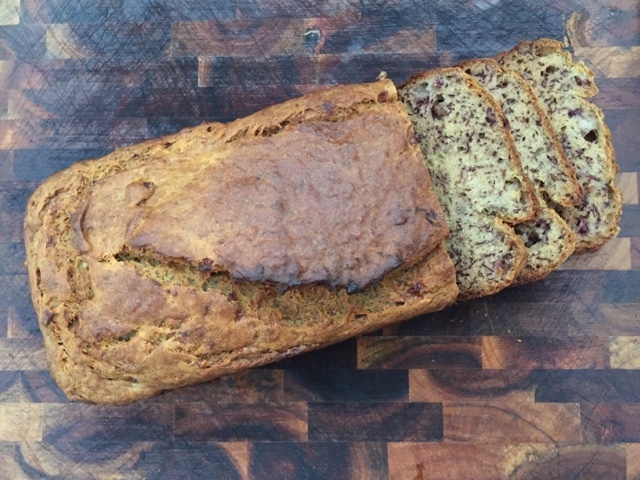 Alas, here is the recipe for my Six Ingredient + No Sugar Banana Bread. Oh yeah, break out your mixing bowl and a spoon.... no mixers needed! Yeah! Pre-heat oven to 350 degrees, Spray a loaf pan with non-stick cooking spray. In a large mixing bowl, mash four ripe bananas with a fork. Slowly drizzle and stir in the melted butter (I melted it in the microwave). Add one egg, the teaspoon of baking soda and a pinch of the kosher salt. Mix together. Add the flour and mix thoroughly ensuring all the flour is incorporated into the wet ingredients. Pour the bread mixture into the loaf pan. Bake for about 45 minutes. * Use a toothpick to check to see if it is done (the toothpick will come out clean). Cool for about 15 minutes. Carefully remove from the loaf pan and use a serrated (bread) knife to cut into slices. Store in air tight container. * - Cooking times in the oven vary. My oven over-bakes stuff, so I usually shave off 5-10 minutes from a recipe and always check to see if it needs additional time in the oven. The Simply Recipes recipe says it will take about one hour, and to check at 50 minutes. 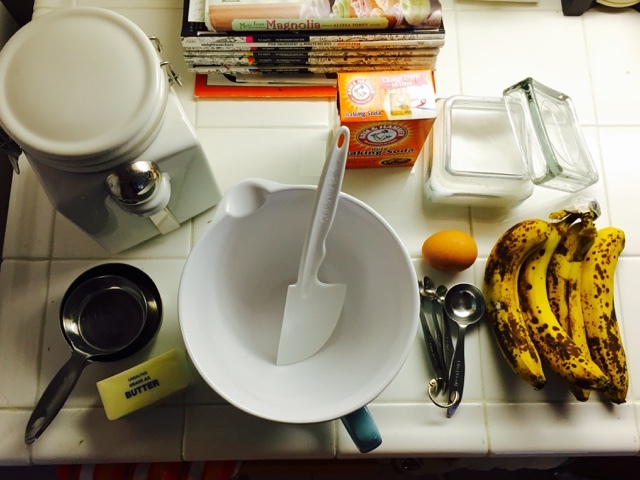 Hello, delicious banana bread! This recipe is super simple to make. The natural sweetness from the bananas and knowing that there isn't any added sugar makes it even better. M loves it so much that he already ate half of it by himself, I love a slice warm with a little butter. Try it and let me know what you think. ENJOY! 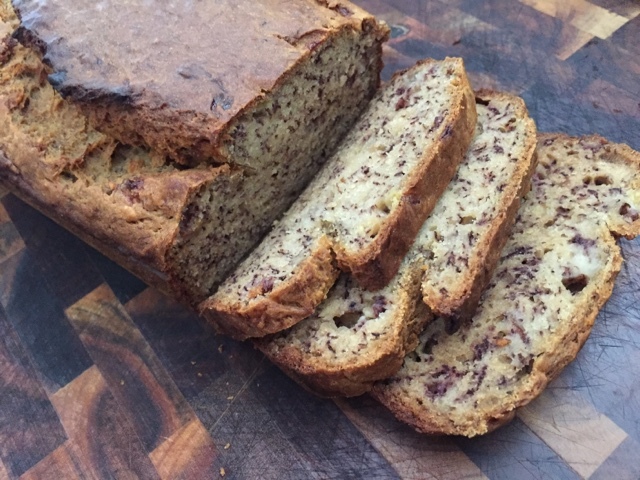 Source: Thank you to Simply Recipes for initially getting me to make banana bread to use my overripe bananas! The Brigantine Seafood and Oyster Bar in Point Loma (Shelter Island) has been in San Diego since its opening in 1969. I have visited this location a few times and I have to say, I really enjoy it for their fresh seafood and for their prime location near the water. When M and I dated, he lived in the area so we used to take weekend walks to Shelter Island, including a few visits to the Brigantine for lunch and when his parents were in town. My mom ordered the Pork Belly BLT. 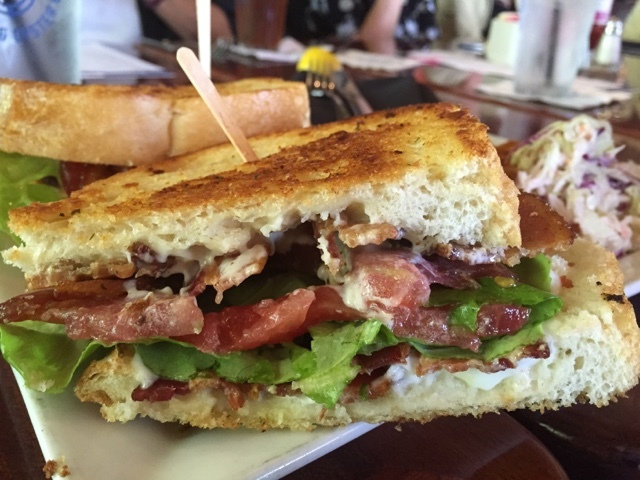 This sandwich was so large and great for sharing! It basically was a regular BLT since there was only bacon in there (not large pieces of braised pork belly, which I was hoping for... for her, haha). It was served on toasty, buttery sourdough bread, with crisp tomato, and greens. It still was delicious. The bacon was crisp. 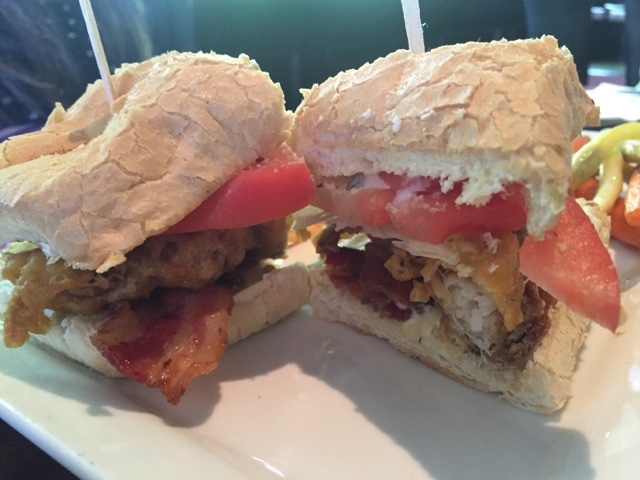 I loved all the crunchy components of this sandwich. It sounds like it was my entree, huh. Yeah, my mom gave me half of it. Yum! The sandwich also came with coleslaw and homemade kettle chips Double yum! 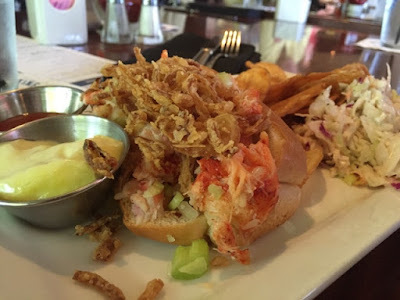 My dad ordered the Lobster Roll. My dad was a couple seats away from me and he eats fast, so I did not have a chance to have any of his. I was able to capture a quick picture of it before it was devoured. 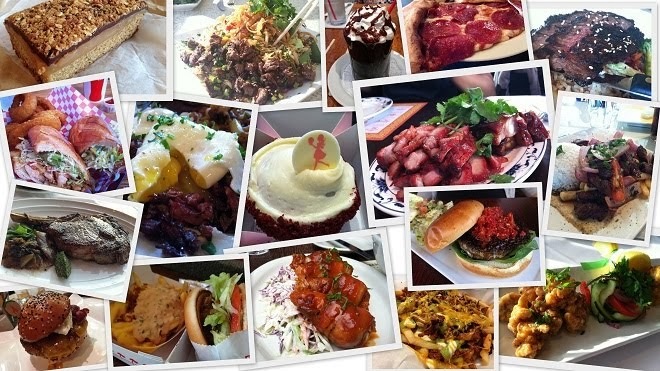 It looked amazing, though, with those crunchy fried onion on top of the sweet lobster. He opted to have the aioli on the side. This sandwich also came with the kettle chips and coleslaw. My sister ordered the Soft Shelled Crab Sandwich. I was not able to taste hers, but it looked pretty good and she said it was delicious. The bread looked warm and crusty. The soft shell crab looked crispy too. I think she ordered steamed vegetables on the side, instead of the usual chips and slaw. Oh yes, this is my dish. 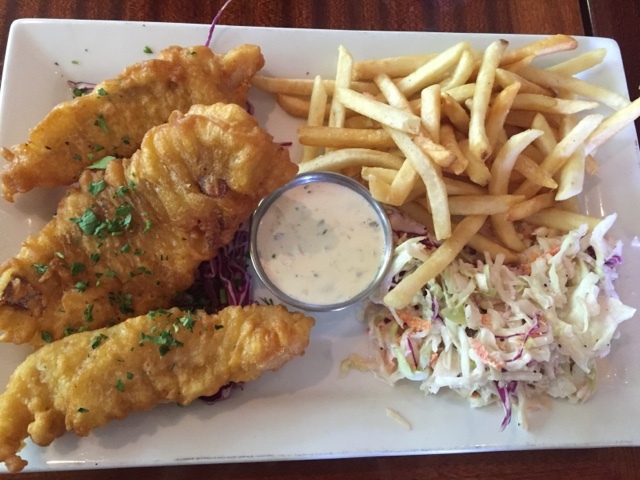 I cannot, repeat, cannot pass up a plate of Fish n' Chips. I love the dish too much! As you can see, it comes with three fresh pieces of white cod, tartar sauce, french fries and creamy coleslaw. The fried pieces of fish arrived were still crispy in texture when I made myself a bite. 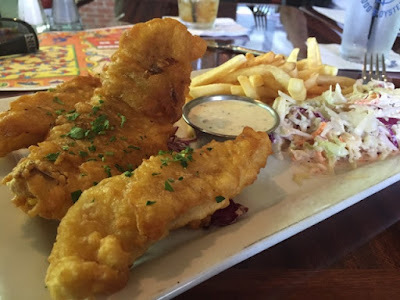 I added a little bit of the tartar sauce for each bite of the white, flaky fish. So good. I am a coleslaw lover, too. I love it for its tang, crunch and acidity. The kitchen plated my fish n' chips very lovely, that I had to take a picture of it this way, which I rarely do. 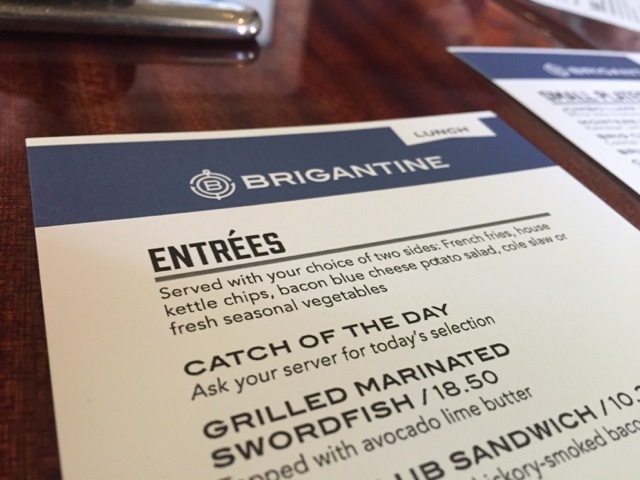 I really enjoy the lunch menu here, more than their dinner menu, which is a tad pricey. The staff is very friendly and were really accommodating with our large group.